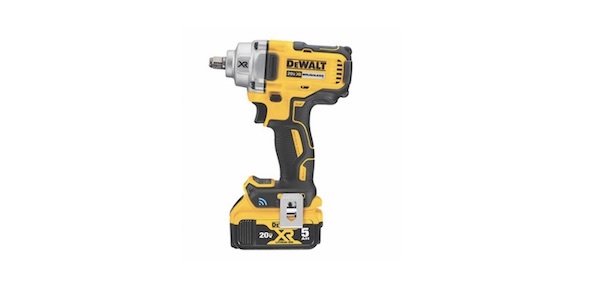 DEWALT has added to its growing line of 20V MAX tools with the XR 1/2″ Mid- Range Impact Wrench featuring the TOOL CONNECT system (DCF896). The TOOL CONNECT system allows for tool control through its PRECISION WRENCH and PRECISION TAP control features, as well as a variety of additional customizable settings within the TOOL CONNECT app. The impact wrench achieves 0-2000 RPM, 3100 impacts per minute, and a maximum torque of 330 ft.-lbs. in forward and 600 ft.-lbs. in reverse. At 6.95″ in length and 3.48 lbs. (tool only), it’s available in both Hog Ring and Detent Pin configurations. This wrench also features a brushless motor, variable speed trigger, and LED light.